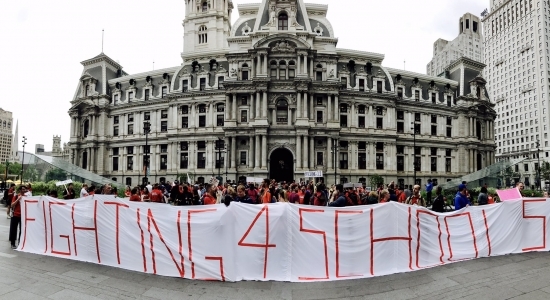 Around 1,000 teachers for the School District of Philadelphia called out today to take part in the "May Day of Advocacy for Philly Schools." The educators with the Philadelphia Federation of Teachers used personal days to participate in the "Day of Action" to protest and draw attention to the long time contract disputes with the school district, SRC, and the city. Demonstrations were held outside of teachers' schools. Teachers have been working for 4 years without a raise and 5 years without a contract. School was still in session as substitutes were called in for the day. A two-alarm fire broke out on a series of row homes under construction in the Point Breeze neighborhood of Philadelphia early Monday morning. It started at 4:15 a.m. in the middle of 11 homes still being built at the corner of 20th and Wharton Streets. It took the 75 firefighters on scene around an hour to bring it under control. Fire Commissioner Adam Thiel said fire in unfinished construction is especially difficult because there are no separations and air can easily flow. Two of the buildings were completely destroyed. There were no injuries. Developer Ori Feibush said three had already been completed and five were already sold. The new development has caused controversy in the neighborhood. Fire marshals are tried to determine a cause of the blaze, nothing has been ruled out including arson. See video below. A woman was killed after she rear-ended a medical supply box truck late Monday morning in Delaware County. It happened just before noon at South Providence Road and Chester Road in Nether Providence Township. The woman's SUV hit the box truck and became wedged underneath the back. There was also a handicapped adult in the back seat of the SUV who suffered a head injury and was taken to the hospital. The driver of the truck was not injured. No word on what led up to the accident. The identity of the woman has not been released.